While some would immediately jump to a solid “Yes!” after witnessing the raw processing power of Microsoft’s HoloLens technology, others have spoken resounding “No!” and there’s an interesting reason behind their logic. It should be said that VR has its place in medicine but it might be a long time before schools make the call to completely replace human bodies. Many schools have already embraced all types of media, including: games, multimedia, and 3-D printing. Virtual dissection tables are one of the best examples of how technology can teach students in a way that has never been seen before. Students can rotate a digital human body 360 degrees and peer into any section or layer of the body as we understand it, today. The fault doesn’t rest so much in the technology that is currently available, as it does with the methods of teaching. You have to remember that it wasn’t long ago that teachers were blown away by the use of PowerPoint and Excel, seeing it as a game-changer for teaching, only to struggle with implementation in class for years after its introduction. That being said, it might be a while before teachers are comfortable enough with the technology to abandon the use of cadavers, a practice that’s been used for hundreds of years, for VR. 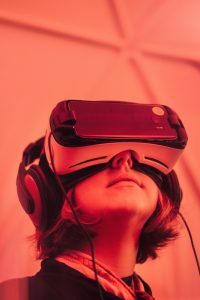 It should also be known that some of the top companies in the virtual reality industry are already working with medical schools in a few different ways. However, these are seen as more supplementary, being able to see a cross section of the human body and sifting through layers as you please is a pretty handy tool, though. As with any technology, when people become more accustomed to it, it will begin to replace older methods. Even now, the University of Southern California Institute for Creative Technologies is advancing the use of VR in their MedVR Lab, for fields, such as behavioral medicine, motor skills rehabilitation, and cognitive assessment. Technology like iPad apps for anatomy have already impacted medical education in a huge way and while VR isn’t quite mainstream yet, it should definitely make waves once there is a virtual reality or augmented reality set in every home.